This entry was posted in Uncategorized and tagged abroad, armed forces, cellphone, cybersecurity, elections, internet, mobile, november, safety, tech, technology, votes, voting. India-based tech support scams have taken a new turn, using phishing emails targeting Apple users to push them to a fake Apple website. This phishing attack also comes with a twist—it pops up a system dialog box to start a phone call. The intricacy of the phish and the formatting of the webpage could convince some users that their phone has been “locked for illegal activity” by Apple, luring users into soon clicking to complete the call. Scammers are following the money. As more people use mobile devices as their primary or sole way of connecting to the Internet, phishing attacks and other scams have increasingly targeted mobile users. And since so much of people’s lives are tied to mobile devices, they’re particularly attractive targets for scammers and fraudsters. “People are just more distracted when they’re using their mobile device and trust it more,” said Jeremy Richards, a threat intelligence researcher at the mobile security service provider Lookout. As a result, he said, phishing attacks against mobile devices have a higher likelihood of succeeding. I attempted to bluff my way through a call to the “support” number to collect intelligence on the scam. The person answering the call, who identified himself as “Lance Roger from Apple Care,” became suspicious of me and hung up before I could get too far into the script. In a review of spam messages I’ve received this weekend, I found an email with the subject line, “[username], Critical alert for your account ID 7458.” Formatted to look like an official cloud account warning (but easily, by me at least, discernable as a phish), the email warned, “Sign-in attempt was blocked for your account [email address]. Someone just used your password to try to sign in to your profile.” A “Check Activity” button below was linked to a webpage on a compromised site for a men’s salon in southern India. While the site is still active, it is now marked as deceptive by Google and Apple. I passed technical details of the phishing site to an Apple security team member. The scam is obviously targeted at the same sort of audience as Windows tech support scamswe’ve reported on. But it doesn’t take too much imagination to see how schemes like this could be used to target people at a specific company, customers of a particular bank, or users of a certain cloud platform to perform much more tailored social engineering attacks. This entry was posted in Uncategorized and tagged apple, applecare, cellphone, hack, internet, ios, it, phone, security, support, tech, technology. Trisis malware targets safety instrumented systems and puts industrial control systems at risk. Expert Ernie Hayden reviews what to know about SIS and its security measures. A newly discovered attack on industrial control systems has the security world uncovering more questions than answers. The 2018 S4 Conference even included presentations and multiple side conversations about the attack called Trisis/Triton/HatMan. The first public awareness of this attack came after cybersecurity company FireEye published a blog post about it in mid-December 2017. The company’s moniker for this malware was Triton. Close on the heels of the FireEye announcement, Dragos CEO Robert Lee published a white paper analyzing the malware that he called Trisis because it targeted Schneider Electric’s Triconex Safety Instrumented Systems. On Dec. 18, 2017, the U.S. Department of Homeland Security’s National Cybersecurity and Communications Integration Center (NCCIC) published its malware analysis report, industrial control systems (ICS)-CERT MAR-17-352-01, “HatMan — Safety System Targeted Malware,” which included its summary of the Triton/Trisis/HatMan malicious code. Almost daily, new commentaries and analyses of Triton/Trisis/HatMan are published. It is obvious that the attack has raised more questions than answers, including: Who orchestrated the attack? Why did they develop this code? What was the attack’s purpose? Are there more malware attacks to come? What is a safety instrumented system? A simple, but not perfect, way to think about safety instrumented systems (SIS) is to consider them part of a dead man’s switch configuration. Dead man’s switch (DMS) mechanisms are used in a variety of operating environments, such as locomotives, lawn mowers, chainsaws, snowblowers, and even for aircraft refueling. The idea is that the DMS must be continuously held or pressed by an operator, and, if the switch/handle is released during operation, the machine will either stop running or transition to a safer state, such as idling. A DMS control in a locomotive can be a floor pedal, trigger handle or push-button where the device must be continuously held or pressed to enable the locomotive to move forward. If the engineer driving the train is incapacitated for any reason, the release of the DMS causes the engine to idle and, in some locomotives, the emergency brakes are applied. The system fails safe. Traditional dead man’s switches in trains can be overridden using duct tape, heavy bricks or other methods, and, in rare cases, the switches can fail to engage when an incapacitated engineer slumps forward. Safety instrumented systems are more complicated than the dead man’s switch described above. However, the SIS is installed — optimally in its own dedicated network zone — so that plant operations can be shut down under extreme plant conditions without human intervention. In other words, the plant can fail safe. An SIS is composed of a combination of sensors, logic solvers and final elements that are separate and distinct from the other plant controls. If the plant is out of control, the SIS is there to shut the plant down with no reliance on human intervention. Some SIS configurations include dedicated sensors that shut down plant operations — such as refineries — when certain pressures or temperatures are exceeded. Another example of an SIS working is a nuclear reactor automatic shutdown — called a SCRAM — when coolant flow is below a minimum rate, etc. Again, no human intervention is necessary. According to standards established by the International Electrotechnical Commission in IEC 61511 and the International Society of Automation ISA S84.01, safety instrumented systems must be separate and distinct — independent — from other control systems that operate and control the same equipment/systems. The controls and control systems contained within the SIS are devoted solely to the proper operation of the safety system. There is no reliance on outside controls or sensor input for the SIS to trip. 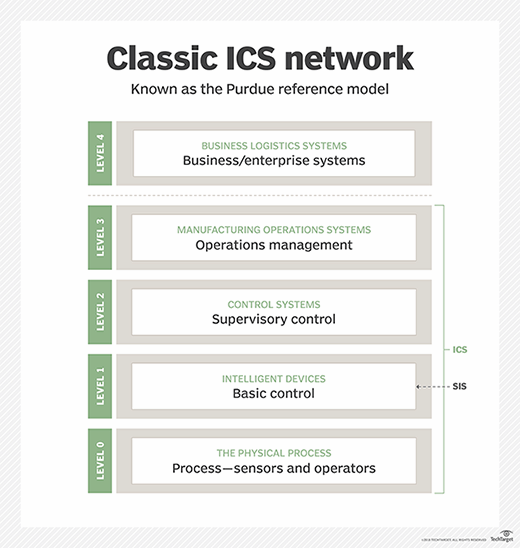 Some ICS security experts may refer to the Purdue reference model — or the Purdue model — when discussing ICS network architecture. The Purdue model is a part of the Purdue Enterprise Reference Architecture, which provides a framework for designing manufacturing systems, and which was developed in the 1990s by Theodore Williams and the members of the Industry-Purdue University Consortium for Computer Integrated Manufacturing. The Purdue model is intended to help users understand a production network. The model organizes an industrial plant network architecture into four levels — plus the underlying physical process level — and is illustrated below. Level 0: The physical process — This is where the physical work in the plant gets done. Level 1: Intelligent devices — This level includes the sensors, programmable logic controllers (PLCS) and the actuators. This level has its own distinct and separate sub-zone specifically for SIS. Level 2: Control systems — This level is where the production is monitored, controlled and electronically supervised, and it includes the production video screens that display the Human Machine Interface and real-time controls and software. Level 3: Manufacturing operations systems — This level is essentially the brains of the manufacturing operations. It includes manufacturing execution systems, maintenance and plant performance management systems, data historians, and middleware. Level 4: Business logistics systems — This is on the enterprise side of the plant. At this level, business-related manufacturing activities are performed, primarily relying on enterprise resource planning software, such as SAP. This is where the plant production schedule is generated and material inventory, shipping and use are monitored and modified. Basically, when you are in the manufacturing plant, you are looking primarily at Levels 0, 1, 2 and 3. In the Purdue model, the SIS is located at Level 1 and comprises its own stand-alone network zone. The safety and protection systems monitor the manufacturing processes and, under emergency conditions, activate and return the plant to a safe state by closing valves, shutting off burners, increasing cooling water flow, etc. These safety and protection systems also include tools that monitor manufacturing and alert an operator of impending unsafe conditions. You should understand that, visually, an SIS and an off-the-shelf programmable logic controller(PLC) or other industrial PC may look the same; however, they have different functions and different implementation schemes. Vendors typically use their current line of PLCs and modify them to fill the SIS role. According to Clint Bodungen’s Hacking Exposed: Industrial Control Systems, “… the SIS typically uses a complicated series of both analog and digital 1-out-of-2 or 2-out-of-3 voting systems to monitor and respond to adverse process conditions. Normally, SISs are designated to provide only a few core functions …” when compared to the normal, multifunctional PLC in the manufacturing plant. Safety instrumented systems may not be installed in every plant; however, they will be included in plants that can be affected by hackers, cyberthreats, terrorists or internal attackers, and which could result in serious dangers, such as death, injury, environmental releases, etc. So you may not see an SIS in a benign manufacturing facility, but the refinery next-door would have more than one SIS in place. Essentially the capacity to disable, modify or inhibit the ability of an SIS to fail safely can potentially result in physical consequences, environmental impact, injuries and even death. In the Dragos blog, a FAQ entry rhetorically asks, “Is Trisis a Big Deal?” The answer is yes. Trisis is the fifth known ICS-tailored malware following Stuxnet, Havex, BlackEnergy2 and CrashOverride. Trisis is the first publicly known ICS-tailored malware to target SIS. Yes, the effect of Trisis is disconcerting and brings added attention to the security and integrity of the SIS. However, an SIS can be defeated without exotic malware by placing the SIS controller in bypass, placing the logic solver in an infinite loop, changing the trip and alarm set points, disconnecting the output from the logic, spoofing the inputs, etc., according to Secure the SIS by William L. Mostia. So waiting for SIS malware to prompt you to protect your SIS may not be enough. The SIS is critical to safe plant operations and needs to be designed, implemented and maintained with utmost care and oversight. The Trisis/Triton/HatMan attack has certainly awakened the ICS security community. As observed by Dale Peterson, founder and CEO of Digital Bond, a control system security company based in Sunrise, Fla., and producer of the annual S4 Conference, we are in the early stages of analyzing this SIS malware attack. The industry needs to be reminded of how much we learned about Stuxnet after the detailed work done by Ralph Langner, et al. ; however, it took time and resources before we really knew the details of Stuxnet. We may need to be patient with the ICS researchers who can tell us more about this new SIS malware and how we can best protect ourselves. The latest update on AT&T’s mobile 5G network trials indicates the company will need to work faster to meet its goal of launching a commercial service by the end of the year. AT&T’s latest update on its mobile 5G trials indicates the carrier has significant hurdles to clear to achieve its goal of launching by the end of the year a commercial service based on the high-speed wireless technology. When I look at how AT&T is characterizing these tests, it doesn’t look like mobile 5G to me. Chris Antlitz, analyst, Technology Business Research Inc.
AT&T plans to deliver mobile 5G over the millimeter wave (mmWave) band, which is a spectrum between 30 gigahertz (GHz) and 300 GHz. MmWave allows for data rates up to 10 Gbps, which comfortably accommodates carriers’ plans for 5G. But before service providers can use the technology, they have to surmount its limitations in signal distance and in traveling through obstacles, like buildings. AT&T’s update indicates mmWave’s constraints remain a challenge. In Waco, for example, AT&T delivered 5G to a retail business roughly 500 feet away from its cellular transmitter. That maximum distance would require more transmitters than the population outside of major cities could support, Antlitz said. Other shortcomings include AT&T’s limited success in sending a 5G signal from the cellular transmitter through the buildings, trees and other obstacles likely to stand in the way of its destination. In the trial update, AT&T said it achieved gigabit speeds only in “some non-line of sight conditions.” A line of sight typically refers to an unobstructed path between the transmitting and receiving antennas. Distance and piercing obstacles are challenges for any carrier using mmWave for a mobile 5G network. Buildings and other large physical objects can block the technology’s short, high-frequency wavelengths. Also, gases in the atmosphere, rain and humidity can weaken mmWave’s signal strength, limiting the technology’s reach to six-tenths of a mile or less. While AT&T has likely made some progress in developing mobile 5G, “a lot of work needs to be done,” said Rajesh Ghai, an analyst at IDC. Meanwhile, Verizon is testing its fixed wireless 5G network — a combination of mmWave and proprietary technology — in 11 major metropolitan areas. So far, the features Verizon has developed places the carrier “fairly far ahead of AT&T in terms of maximizing the capabilities of 5G,” Antlitz said. This entry was posted in Uncategorized and tagged 5g, att, Commercial, fast speed, internet, mobile, network, phones, services, slow speed, tech, technology, update. Originally seen: October 2017 TechTarget. keylogging flaw found its way into dozens of Hewlett Packard laptops. Nick Lewis explains how the HP keylogger works and what can be done about it. More than two dozen models of Hewlett Packard laptops were found to contain a keylogger that recorded keystrokes into a log file. HP released patches to remove the keylogger and the log files. How did the HP keylogger vulnerability get embedded in the laptops? And is there anything organizations can do to test new endpoint devices? When it comes to security, having high expectations for security vendors and large vendors with deep pockets is reasonable given that customers usually pay a premium believing the vendors will devote significant resources to secure their products. Unfortunately, as with most other security teams, companies often don’t have enough resources or organizational fortitude to ensure security is incorporated into all of the enterprise’s software development. But even the most secure software development can enable security issues to slip through the cracks. When you add in an outsourced hardware or software development team, it’s even easier for something to go unnoticed. So while vendors might talk a good talk when it comes to security, monitoring them to ensure they uphold their end of your agreement is absolutely necessary. One case where a vulnerability apparently escaped notice was uncovered when researchers at Modzero AG, an information security company based in Winterthur, Switzerland, found that a bug had been introduced into HP laptops by a third-party driver installed by default. But even the most secure software development can enable security issues to slip through the cracks. The vulnerability was discovered in the Conexant HD Audio Driver package, where the driver monitors for certain keystrokes used to mute or unmute audio. The keylogging functionality, complete with the ability to write all keystrokes to a log file, was probably introduced to help the developers debug the driver. We can hope that the HP keylogger vulnerability was left in inadvertently when the drivers were released to customers. Modzero found metadata indicating the HP keylogger capability was present in HP computers since December 2015, if not earlier. It’s difficult to know whether static or dynamic code analysis tools could have detected this vulnerability. However, given the resources available to HP in 2015, including a line of business related to application and code security, as well as the expectations of their customers, it might be reasonable to assume HP could have incorporated these tools into their software development practices. However, the transfer of all of HP’s information security businesses to a new entity, Hewlett Packard Enterprise, began in November 2015, and was completed in September 2017, when Micro Focus merged with HPE. It’s possible that Modzero found the HP keylogger vulnerability while evaluating a potential new endpoint for an enterprise customer. They could have been monitoring for open files, or looking for which processes had the files open to determine what the process was doing. They could have been profiling the individual processes running by default on the system to see which binaries to investigate for vulnerabilities. They could even have been monitoring to see if any processes were monitoring keystrokes. Enterprises can take these steps on their own or rely on third parties to monitor their vendors. Many enterprises will install their own image on an endpoint before deploying it on their network — the known good images used for developing specific images for target hardware could have their unique aspects analyzed with a dynamic or runtime application security tool to determine if any common vulnerabilities are present. This entry was posted in Uncategorized and tagged cybersecurity, hack, hacker, internet, it, keylog, keylogger, laptop, security, technology, threat.